Jeremy Corbyn has been accused by PR professionals of a serious PR blunder over an apparent exaggeration of overcrowding on a Virgin Trains service - while the Branson-owned rail operator has been praised for its response. Several of today's papers give prominent front-page space to the row that has erupted between Virgin Trains and the Labour leader, with scathing criticism in particular coming from the right-wing outlets. Virgin Trains released a press statement yesterday responding to footage released by Corbyn's team to the media nearly two weeks ago, in which the politician was sat on the floor of a Virgin Train from London to Newcastle on 11 August, complaining of it being "completely ram-packed" and empathising with commuters, who he said faced the problem on a daily basis. 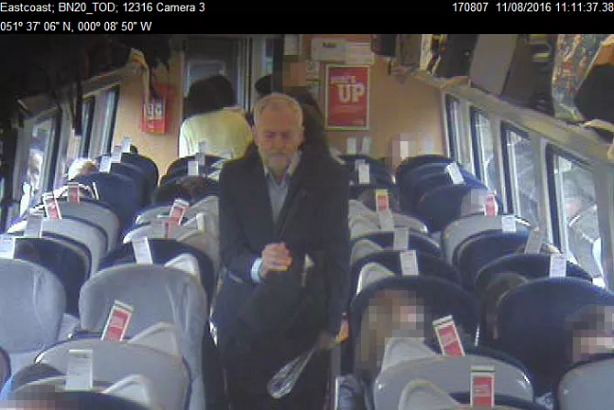 The train operator included several images and clips from CCTV footage and details on timings, saying that the Labour leader, who faces a challenge to his leadership which will conclude next month, "walked past empty, unreserved seats". Corbyn's team stuck by its story, also providing corroborating accounts from fellow passengers, while news outlets have also taken accounts from other passengers. Regardless of whether or not there were enough seats for Corbyn at a particular time or not, Virgin Trains has done well in "creating doubt", according to Chris Gilmour, a director of Beattie Communications. "You’ll get Corbyn supporters saying he was right, you’ll get anti-Corbyn people saying no he is wrong, but what Virgin Trains has done is create doubt – there is now not the historical fact that Corbyn was sitting on the floor becuase there weren’t enough seats," he said, adding that this had "destroyed the credibility" of any Corbyn, union or Labour attempt to use that incident as proof of a need to re-nationalise rail services. Gilmour said that Virgin Trains would have seen this as an issue of "business protection", given that it runs a service that was previously publicly owned. "Corbyn is backed by unions, Virgin Train runs a formerly publicly owned railway, and unions are trying to undermine privately owned railways," he said. Sarah Ogden, corporate director at 3 Monkeys Zeno, told PRWeek that Corbyn was unwise to take on Branson and Virgin in particular. "Anyone stepping up to this challenge needs to be fit for the fight and not naive to the consequences," she said. "As exemplar PR operators, Branson and the Virgin brand typically respect and engage the media with the professionalism expected of their position. Virgin Trains’ quick response is measured, factual and formal. Hitting both social and more traditional media formats. It clarifies the brand’s position with visual and written evidence." Ogden also said that while Corbyn has, according to some, suffered media misrepresentation, he has brought this particular negative story on himself. "Arguably, choosing to refrain from active participation with journalists, and now issuing an opportunist story against a seasoned pro like Branson, reinforces the perception that Corbyn’s poor judgement and amateur approach to the media are the reason he fails to control his story," she said. Claire Maloney, a partner at CNC Communications, said: "Virgin is a brand that likes to play by different rules and even in established industries it seeks to challenge the status quo. Its action comes as no surprise." She said that this case, alongside that of the US Olympic swimmers disgraced after claiming to have been robbed in Rio, demonstrate that the rapid sharing of photos and videos on social media "can play an increasingly important role in defending reputations". Other PR professionals, such as the co-founder of Nelson Bostock, were more firm in their criticism of Corbyn. PRWeek asked its followers on Twitter for their views. @prweekuknews when the senior politician is making up stories then yes! @prweekuknews I'd say they were perfectly within their rights to do so. Corbyn tried to slander their brand to gain a political advantage.